Ann Little (President, EFNA) opened the meeting welcoming participants and underlining that stigma is at the top of the list of important issues for all those affected by brain, pain and mental health disorders. Stigma stems from ignorance and fear and has pervasive consequences in all areas of life. Stigma not only results in negative behaviour; it has many other consequences, for instance in the area of funding. Brain, pain and mental health conditions occur twice as much as cancer-related conditions, yet research on cancer and cancer organisations receive twice as much funding. There is a need for more awareness of these conditions, which will also help those affected to seek help earlier. Ann Little then gave the floor to Marian Harkin MEP, who paid respect to GAMIAN-Europe President Pedro Montellano, who sadly passed away on 2 October. A one minute silences was observed. Marian Harkin welcomed the two Interest Groups working together on this issue, and emphasized the grave influence of stigma persons affected by brain, pain and mental health conditions and their carers. There is a growing need for more awareness and clear information. Listening to those who suffer stigma and how it impacts on their lives is crucial in this respect, and the meeting provided the opportunity to do just that. 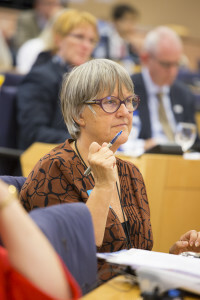 Nessa Childers MEP agreed, and stated that it is hugely important to get stakeholders and the general public interested in these conditions, as more and better information will help reduce stigma. She considers it part of her duty as an MEP to host meetings of this kind. During this session, Liisa Mikonen (person affected by chronic pain), Andrea Bilbow OBE (parent of children affected by ADHD) and Emily Benson (daughter of dystonia patient) shared their personal experiences of stigma. Liisa Mikonen talked about the prejudice, disbelief and negative attitudes her condition triggers in society, working life and social and family life. She also wondered why patients are viewed so differently from non-patients and why their opinions and knowledge often do not seem to count. Andrea Bilbow talked about society, the media and teachers blaming her (parents in general) for the problems and condition of children affected by ADHD. She also underlined the stigma surrounding existing medication for ADHD and expressed the hope that ADHD would be recognized as a mainstream and treatable condition. Emily Benson told her story as a daughter of a cervical dystonia patient, which was diagnosed when Emily was seven. She has become a real expert on the disease and while her mother, Emily herself and her family have found a way to live with the impact of dystonia, stigma is a negative factor. Emily would wish for much greater awareness of the condition, which would help overcome stigma. Closing the session, Nessa Childers MEP underlined the importance of learning from these testimonials and the need for more awareness, education and training. The first speaker in this session was neurologist Prof. Matilde Leonardi (Besta Neurological Institute) who informed the audience of the outcomes of a Patient Experience Survey carried out by EFNA between November 2014 and February 2015. This was a cross-sectional study involving organisations involved with advocacy and support for patients with neurological conditions in 27 European countries. The data analysis was carried out by Professor Leonardi and her team. The survey consisted of a questionnaire created by EFNA, collecting information on socio-demographic variables, clinical variables, impact on various life domains, social support, psychological symptoms, somatic symptoms, and stigma. Almost 5.000 patients replied. One of the main finding was that 57% of the sample feels stigmatised at least occasionally. To evaluate the stigma in all its components, 3 scales were developed, addressing workplace stigma, social stigma and overall well-being. In relation to workplace, it was found that 11% of the total sample (457 persons) perceive a relevant workplace stigma. The findings showed that 16% of the total sample (712 persons) perceive a relevant social stigma. And in terms of overall well-being, 17% of the total sample (710 persons) perceive an overall negative well-being. Another interesting finding was that persons who think that their condition should have been diagnosed earlier perceive a significant higher workplace and social stigma and a worse overall well-being compared to persons who think that their condition was diagnosed on time. Matilde Leonardi further stated that according to the bio-psycho-social model disability is the result of an interaction of a health condition with the environment: any barrier in this environment increases disability. Stigma is such a barrier, as it increases disability of people with all psychiatric and brain disorders. This is a violation of human rights as well as a violation of dignity of the person; stigma stands in the way of equal opportunities. Delays in diagnosis or denying the patient the right to be prescribed the most efficacious drugs are examples of such ‘barrier’ behavior. Therefore, stigma should not only be investigated in surveys, but also considered when planning policies and interventions for people with neurological disorders. A “fit for purpose” data collection with validated instruments could allow a better tailoring of possible interventions and services. Much remains to be done at different societal levels, to identify behaviors, laws, attitudes and practices that could be prevent stigma, but interventions ARE possible and are a political choice. The second speaker, Paul Arteel (Executive Director, GAMIAN-Europe) informed the audience of the patient’s perspective on stigma and exclusion, as measured by a number of patient surveys carried out by his organisation. These assess the views of the “expert by experience” on specific themes (stigma, physical health, adherence to treatment, mental health and workplace). These are not intended as academic studies; rather, they serve to assess what lives amongst patients, to feed into advocacy activities, help inform policy makers and help clinicians to know the extent to which patients’ views can positively or adversely influence therapeutic outcomes. The first GAMIAN-Europe survey (2006) addressed stigma and yielded 4500 responses from 20 countries. A second, identical survey on stigma was carried out 5 years later, in order to see if there were (positive or negative) changes. The surveys were designed to measure the levels of internalised stigma, the degree of perceived discrimination and the levels of self-esteem and empowerment). It was found that a positive evolution on self-stigma and empowerment had taken place. However, there was a small increase in the level of perceived hold negative attitudes by the general public. Stigma has been a major item in other GAMIAN-Europe surveys as well. For instance, the 2011 survey on Physical aspects of Mental Health showed that 20% of the patients that experienced barriers to contact a doctor to treat physical problems indicated stigma and fear of disclosing their mental health problem to their GP as the reason. The 2013 survey on Mental Health and Workplace (2013) revealed that 50% of the patients did not want to inform their employers on their mental health problems. In conclusion, Paul Arteel underlined that, for people confronted with mental illness stigma is not a theoretical concept; it affects daily life, physical health, treatment and social inclusion. He made a strong plea for access to and availability of psychotherapy, as human contact remains one of the most vital elements on the way to recovery. The final speaker in the session was Joop van Griensven (President Pain Alliance Europe), who stated that stigma relates to a belief in false or inadequate information with a strong impact on the person and their families. The social impact is enormous Where does it come from? Who creates this? Is it the general public, regulators, health care professionals, patients? It is the right of a patient to avoid unnecessary pain. However, the experience of patients is often not believed – because of stigma. This needs to be changed. A recent survey, The PAIN Patients Pathways Project, amongst health professionals has found that 77 % of those questioned state that they believe their patients. This is interpreted as a good result; however, it still leaves 1 in 4 health professionals that does not believe patients. So 25 million pain-patients in Europe have a doctor that does not believe them. The findings in governmental institutions are even more devastating. These issues should be addressed at a higher policy level. The differences between countries in terms of access to services and treatment and basic patients’ rights are enormous and these differences should be addressed by a higher authority. Stigma cannot be changed by pointing at others and expecting them to take action. It can only be solved if patients and other stakeholders work together. This is why a European awareness campaign will be developed by EFNA and the European Pain Alliance, in order to create an environment of trust between all stakeholders. This will help to achieve the basic right of each patient: the right to be believed. 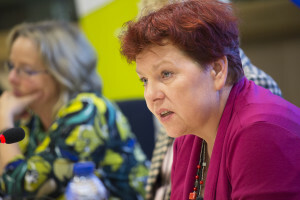 Nessa Childers MEP then gave the floor to Michael Hübel (European Commission, DG SANTE) who shared some reflections. Better jobs and improved growth are the key priority for the Commission. Economic, social and employment policies and healthy populations, enabling people to be part of society are all part of this priority. Three quarters of EU health care cost are related to chronic disease and the proportion of brain disorders and mental health conditions within this is huge. This does not only relate to the direct costs of the conditions, but also to indirect costs, due to (for instance) long term absence and early retirement. If awareness of these facts does not increase and if policy makers and service providers cannot be convinced that this is a serious issue, a situation where people will not reach their full potential will be continued. Stigma is a very important aspect in this respect. It often relates or leads to outright discrimination. There are several tools, such as the Convention of the Rights of People with a Disability, to which the EU has signed up. The Commission’s Mental Health Pact, the Joint Action on Mental Health and the work carried out to address mental health in the work place are all useful actions taken by the EU level. How do people with mental disorders see themselves in this equation? While on the one hand side, we need the testimonials and experience of people affected by mental health conditions to raise awareness which could help combat stigma and address their needs appropriately, patients themselves are often reluctant or even fearful to reveal their situation. The workplace would seem to be an ideal setting to promoting mental health and well-being, because so much time is spent there. In terms of the organisation of health services, the general trend towards community care based services should be seen as an opportunity to bring mental and physical health services together. However, the philosophy upon which these services are based will determine how they deal with and combat stigma. Brain disorders can be prevented and we need more investment in policy and research. All these issues need to be looked at as the Joint Action on mental health is coming to a close. Michael Hübel concluded by underlining that if we want to truly tackle the issues around chronic disease, we will need to look at mental as well as at physical health. 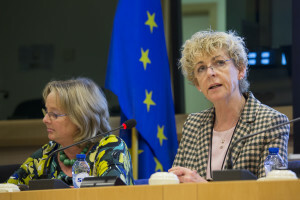 Marian Harkin MEP then gave the floor to Heather Clarke (EFNA), who briefly introduced the draft work plan for the Brain Mind and Pain Group in the area of stigma. The main activity will be the launch of a European awareness campaign addressing stigma, entitled ‘Under the umbrella’. This launch will take place during Brain Awareness Week and will take place in the European Parliament. Heather Clarke also announced a meeting of the Brain Mind and Pain Group taking place on February 24 addressing issues around the workplace. Another meeting scheduled for June on the topic of patient involvement in research. Paul Arteel (GAMIAN-Europe) outlined the plans of the Interest Group on Mental health, Well-being and Brain Disorders, stating that the overall aim for the coming period is to ensure an appropriate and more comprehensive follow-up to the EU Joint Action on Mental health. GAMIAN-Europe will be working with the co-chairs to table amendments to this effect for all relevant policy reports going through the European Parliament. The next meeting will take place in December together with the Interest Group on Carers, which will address the needs of those caring for persons with mental health conditions. For next year, joint meeting with the European Brain Council and the Brain, Mind and Pain Group are foreseen. The way doctors communicate with patients’ needs to be addressed. Often this is done in a patronising manner, and this helps to perpetuate stigma. Several organisations of specialists informed the audience that they are in the process of working with patient organisations in various ways, for instance by setting up a patient liaison committee and organising joint sessions at relevant meetings. It is increasingly felt that working together with (neurological) patients is the only way to ensure better quality of life and better health. The right to work, as enshrined in various Charters, is not the same as having the opportunity to work. Stigma very often gets in the way. While the principle is positive, it is void of content. The EU should take concrete action to tackle this. Information and awareness needs to be improved and increases. When developing the stigma campaign a number of different dimensions and variables need to be taken into account such as the audiences (different messages may be required for different stakeholder groups) and whether it will be implemented top down or bottom up. It is not only those affected by brain, pain and mental health conditions that suffer stigmatisation; those who treat them (psychiatrists, psychologists) are stigmatised as well. Listening to patient testimonials is important; it educates health professionals and helps them deal with patients better. Professional curricula taking better account of the patient experience and knowledge are being developed, and these should become the standard. The EU level could help the exchange of good practice and support wider dissemination of these curricula. Events such as these provide the opportunity to talk directly to the policy makers. However, in these conversations we should not just present problems but also focus on possible solutions. It also needs to be borne in mind that health care remains a national competence and that it is unrealistic to ask for European legislation.